Reading Twitter analytics can be hard if you are unsure about what you are looking at or find looking at all those numbers really scary! This posts serves only as an overview to help you make informed decisions about what you post, when and how it is written. I have read posts where people say that page/ post views ‘do not matter’ and the like but I struggle to understand this. By working out the best times to post, which posts work well and why means that you can maximise upon this to help increase your engagement and following, which is what everyone strives for! Once you have opened up Twitter analytics and clicked on the ‘tweets’ section you will get onto the 28 day page analysis. Click on the export data button, the last 28 days button next is where you can adjust the dates, I usually do a month by month analysis. Open the Excel file that you have downloaded. You can see lots of different columns, it can look quite intimidating the first time but we are going to get rid of loads of columns to make it easier to read the data. I get rid of these purely because they are of no use to me, I will not gain anything from them. Depending on what media you use I usually get rid of every column from permalink clicks onwards. 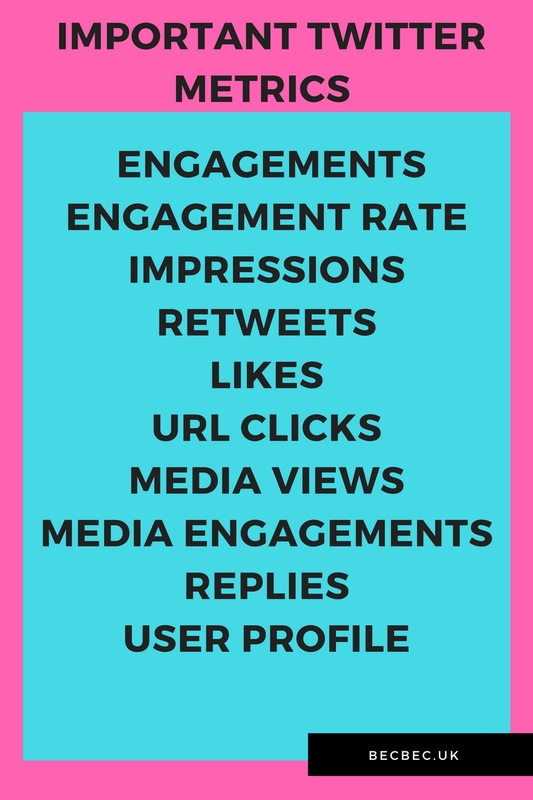 Engagements are the number of times your tweet has been engaged with. cards, embedded media, hashtags, follows, favourites, links, profile clicks, retweets, replies, usernames and tweet expansions. The number of retweets. This is a good metric as it shows that people value the content enough that they want people on there own feed. Again simply put the number of likes, another good metric as it shows appreciation of the tweet. This metric is the number of times a message is served to a user in a timeline or search results. I am not keen on this metric because the way I see it because it is a timeline it does not necessarily mean that it is read. The number of times a URL is clicked on. As Twitter doesn’t total the metrics up for you, I automatically use SUM and add up all the columns first so I have a total. I then use mean to find the average. Both metrics are useful as I can see what was achieved that month and with the average I can see how many engagements were made over the number of tweets. The more engagements per tweet means more people engage with the posts. Afterwards I filter the data – I filter whatever metric I need to see which tweets received the largest amount of engagement and also which didn’t and then look further to see if it there is a certain way I wrote the tweets with the largest/ least engagement.Has this basic guide made you want to use Twitter metrics more? Next Post Thought of the day – Do you wish you could see what your future has planned for you?